A joint project by Praxis Theatre and The Theatre Centre, Civil Debates is a monthly debate series that facilitates public discourse of current, often divisive perspectives for a live audience. Audience members will also be given the opportunity to participate and vote on who they agree with! The topics for the first four debates of the series will be suggested by YOU, the community, via a live installation on January 12 & 13 at the Next Stage Festival’s tent at Factory Theatre. Sticky notes and a laptop will be available to post issues and ideas that you think would benefit from more debate or to suggest who you think would be a great debater. The goal is to emerge with four questions that will inspire compelling debaters to participate in an event that has genuine community interest. if you cannot make it to the live installation this weekend, you can always share your ideas via email. 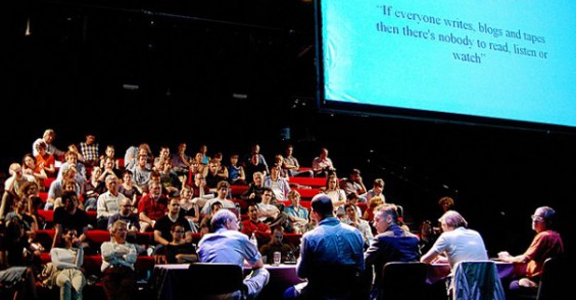 Debates will take place monthly at The Theatre Centre Pop-Up in March, April, May and June, 2013. WHERE: Next Stage Festival Tent @ Factory Theatre Courtyard, 125 Bathurst St.